Description: Arram Draper is on the path to becoming one of the realm's most powerful mages. The youngest student in his class at the Imperial University of Carthak, he has a Gift with unlimited potential for greatness--and for attracting trouble. At his side are his two best friends: Varice, a clever girl with an often-overlooked talent, and Ozorne, the "leftover prince" with secret ambitions. Together, these three friends forge a bond that will one day shape kingdoms. And as Ozorne gets closer to the throne and Varice gets closer to Arram's heart, Arram realizes that one day--soon--he will have to decide where his loyalties truly lie. 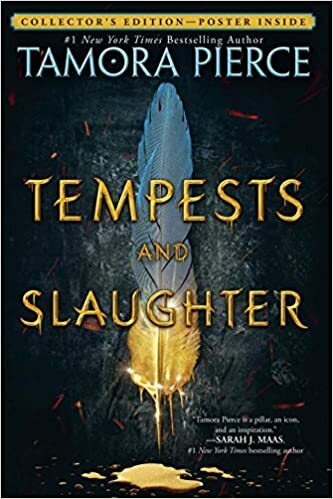 My Thoughts: TEMPESTS AND SLAUGHTER tells the story of a young Arram Draper who is a student at the School for Mages at the Imperial University of Carthak. He is the youngest student there. He was born in Tyra in a family of people who work with cloth but his magical abilities gained him acceptance at the School for Mages. Arram has a bit of a hard time when he is first there because he is so much younger than the other students and so very talented. Once he meets Ozorne, who is an Imperial Prince but not very close to the throne, and Varice who is another young talent things get better. The three form a firm friendship. Arram's abilities lead him being taught by Masters in the various disciplines and they also lead him to being noticed by the gods - which is a mixed blessing. One such happening is when Enzi the Crocodile God asks him to take custody of a Sunbird from the Divine Realms until he can come up with a gift grand enough to appease Mithos who really hates it when someone steals one of his Sunbirds. Thus, the Sunbird Preet becomes one of Arram's companions. This story follows Arram through a number of years of his schooling. It also sees him becoming more aware of the world around him and less able to tolerate the idea of the slavery that exists in the Empire and the cruelty of the gladiator games in the Arena. He befriends a gladiator who rescues him when he falls into the Arena and the two keep crossing paths. First when Arram is taken by his teacher to work with victims of the Plague and then when he is taken to the Arena to care for gladiators during one of the Arena games. Happening outside the school but impacting Arram, is that Ozorne is coming closer and closer to the throne as his fellow heirs die in a variety of accidents. He is also watching Ozorne change from a boy who wants to be a mage with a small household and his friends to a young man who is beginning to cast his eye on the position of Emperor. Arram's vast curiosity about magic and the world also grows and he begins to realize that he doesn't want either of the lives Ozorne imagines him living. Arram wants to leave Carthak to explore and get away from a place with slavery. This story was well-written and engaging. It provides background for a character who appears in a number of other books by Pierce. It also begins a series which I can't wait to read. Arram hated boredom. That was the source of many of his problems. Bored, he might tinker with the spells he was taught -- just tinker, not actually cast the whole thing! Then came visits to the healer, unhappy interviews with instructors, and labor or essays after that. Lol I wasn't planning to read this though I have read most of the other Tortall books. And you changed my mind and now I have to read it.